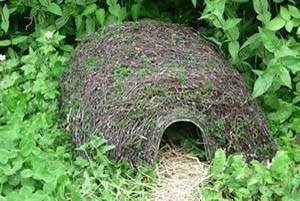 The Wildlife World Hogitat is designed to be an attractive natural home and safe retreat for hedgehogs. It features a sturdy, rust-proofed steel frame, a waterproofed roof with an attractive natural finish, and a predator defence tunnel. Specifically designed to blend into the garden setting, the Hogitat has an attractive natural appearance that will comfortably nestle into any garden environment. Siting:Choose a quiet position out of the prevailing wind in an area with some nearby cover (areas of the garden with slugs – a natural food source). Features: Principally natural materials and appearance. Economic yet effective safe retreat for hedgehogs, or small mammals.